Auction starts at 12:00 PM PT. Potential bidders are invited to join us for a VIP Preview on Friday evening, April 24th from 5:00 PM – 9:00PM. Saturday, April 25 | 12:00 PM PST. Our first West Coast Automobile Auction taking place in our Las Vegas showroom on April 25, will include more than 40 fresh-to-the-market, classic vehicles up for bid, ranging from vintage gassers to the pinnacle of contemporary luxury. “We believe this will be the most diverse automobile auction in Las Vegas history,” said Peter Sidlow, president of Morphy Auctions, Las Vegas. All auctions are available for preview by appointment. We will be hosting an extended preview evening on Friday, April 24, 2015 until 9:00 PM. During its first auto auction at Morphy’s Denver, Penn. showroom in October 2014, 40 highly collectible vehicles from the dawn of the auto age to the modern era were sold, including a 1987 Ferrari Testarossa that went for $85,800, a 1952 Jaguar XK120 that hammered for $88,000 and a 1955 Porsche Speedster that commanded $198,000. 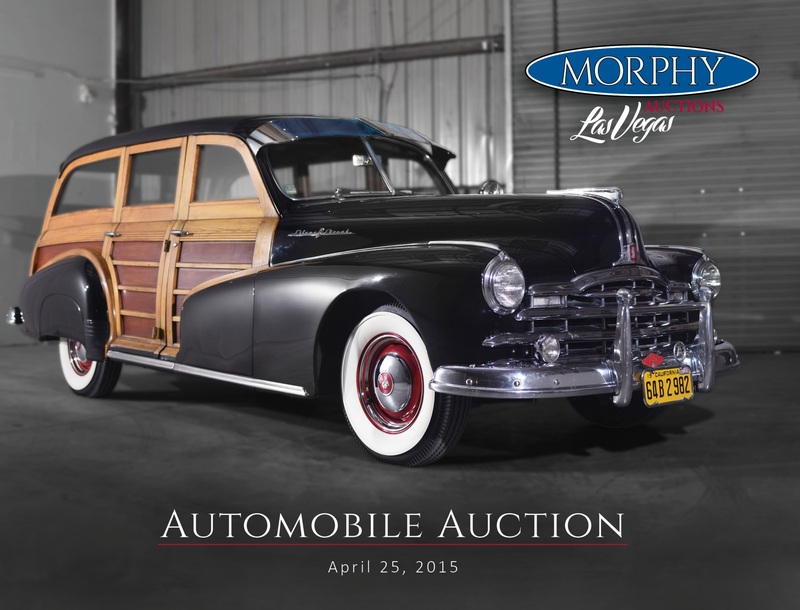 The April Las Vegas auction will follow—and likely exceed—that success, with featured lots such as an extremely rare 1948 Pontiac Silver Streak “Woody” wagon, outfitted with nearly all available options for its model year (including a hydramatic transmission). With only 35,000 total miles since new, this museum-quality model retains its original canvas top, wood panels, interior details and floor mats, as well as original books and advertising brochures, and is expected to command $150,000-$175,000 at the auction. Another standout in the auction is a blue 1955 Porsche 356 Pre-A 1600 Speedster, with a 1964 Porsche 356C motor and vintage livery from its participation in the La Carrera Classic. Held by the same owner since 1975, this rare model has 40 year of maintenance records, rally history, and factory certificate of authenticity. It’s estimated to hammer for $250,000-$275,000. Among the other vintage vehicles in the April auction are a silver-gray 1941 Willys Coupe from the golden age of drag racing, with a low-profile, fiberglass body, 572cu/620hp GM crate motor attached to a TCI TH 400 automatic transmission (collectively designed to handle up to 1,000hp), and rack-and-pinion steering, expected to sell for $60,000-$70,000, and a brown 1951 Chevy 3100 pick-up truck, fully restored to the highest standard with rare options, making this a highly collectible showpiece that’s projected to sell for $40,000-$50,000. Muscle car enthusiasts will find choice models up for bid at the auction as well, including a gorgeous, rust-free, turquoise 1965 Chevrolet Impala SS convertible, featuring factory-original white-and-aqua interiors and white top, expected to bring in $25,000-$35,000, and a fully documented, restored, yellow 1970 Ford Mustang Mach 1, featuring such factory extras as a black hood stripe, FMX select shift transmission and sport deck rear seat, which could go for $35,000-$45,000 at auction. The auction will also feature a number of unique motorcycles, including a custom-built, 2009 Big Bear Choppers Cris Angel “Believe” tribute motorcycle, powered by an S&S Cycle X-Wedge 114-CID engine, with a dramatic black-and-red-flame paint job and only 25 original miles, valued at $25,000-$30,000. Other highlights in the April auction include an impeccably maintained, royal blue 2005 Rolls Royce Phantom Saloon, with Cornsilk interior and rare sunroof option, potentially worth $125,000-$150,000, an iconic, Rosso Corsa 1986 Ferrari 328 GTS with beige interior, a 3.2-liter V8 engine, and only 16,000 original miles, worth potentially $85,000-$110,000, and a stunning, white-on-red 1991 Chevrolet Corvette ZR-1 with original window sticker, books and delivery information, and only 712 original miles, projected to hammer at $35,000-$45,000. The April 25 automobile auction will be held at Morphy’s Las Vegas gallery, located at 4520 Arville St. #1, with a live webcast available to view online via morphyauctions.com. All forms of bidding will be available, including live via the Internet through Morphy Live. Start time is 12 p.m. Pacific. On-site previews are available 9 a.m. to 3 p.m. Monday through Friday beginning April 1, with an extended preview on April 24 until 9 p.m., or on an appointment basis by calling 702-382-2466. 1. 1967 Pontiac GTO Convertible. 2. 1927 Ford Track T Roadster. 3. 1957 Ford Thunderbird Vegas. 4. 2009 Big Bear Chris Angel Tribute Motorcycle. 5. 1970 American Motors AMX. 7. 1972 Plymouth Satellite Pro Street Resto-Mod. 8. 1956 Chevrolet Belair 2dr Hardtop. 9. 1959 Ford F100 4×4. 10. 2007 Harley-Davidson VRXSE V-Rod Destroyer. 11. 1963 Chevrolet Corvair Monza Convertible. 13. 1964 Volkswagen 1200 Beetle. 14. 1986 Ferrari 328 GTS. 15. 1960 Chevrolet Impala Sport Sedan. 18. 2005 Rolls Royce Phantom Saloon. 20. 2005 American Ironhorse Slammer Edition. 21. 1955 Porsche 356 Pre A Speedster 1600. 22. 1955 Mercury Montclair Sun Valley. 24. 1984 Porsche 911 Turbo. 25. 1965 Chevy Impala SS Convertible. 26. 1987 Rolls Royce Corniche II Cabriolet. 28. 1998 Bentley Azure by Pininfarina. 29. 1964 Cadillac Deville Convertible. 30. 2005 Custom Twin Engine Motorcycle. 31. 1958 Pontiac Chieftain Station Wagon. 34. 1940 Ford Deluxe Tudor Sedan. 35. 1998 Mercedes Benz SL600. 36. 1951 Chevy 3100 Pick Up. 37. 1989 Mercedes 560 SL. This print catalog is unavailable. If interested in consigning, please visit our consignment page. Morphy Auctions is one of the largest under-roof auction houses in the country, spanning over 45,000 sq. ft. The beautiful building is customized to meet the growing and changing needs of the antiques industry.